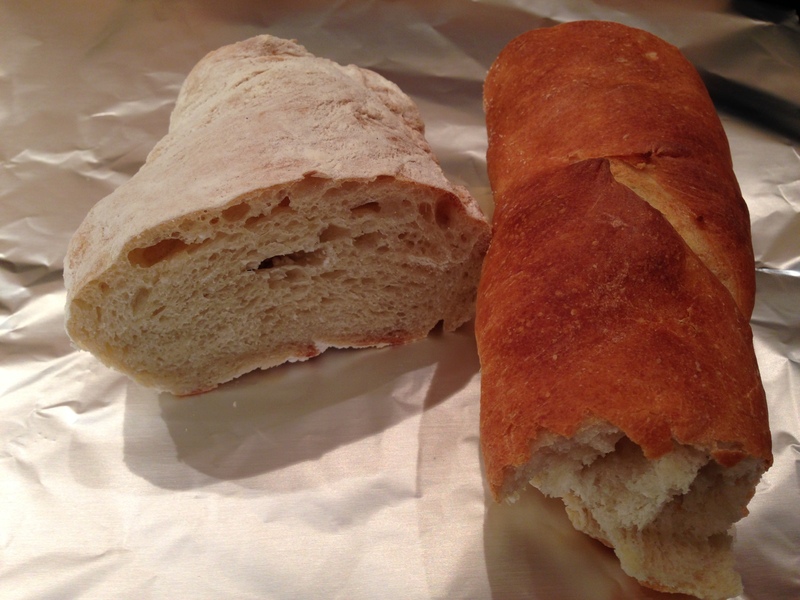 (KERI) Yesterday, I completed an intensive, four-course class on the art of making, baking, and celebrating artisan bread. It. Was. Amazing. Cook Street in my home city does it right. We kneaded, we shaped, we baked, we ate, we drank. Boule, baguette, brioche, challah, sweet bread with raspberries or heaven-help-me cinnamon and sugar, naan, pretzels, cream-filled doughnuts, do I need to go on? It was an utter blast. But here’s the thing, People: I cannot eat another chunk of bread. I’m constipated. I’m constantly thirsty. I’m afraid to get on the scale. I’m dough-ed out for a good long while. But before I bid adieu…or shall I say ah-dough…to this staple that makes the world go ’round, we had pizza dough to make a do with. Who cares that our culminating class at Cook Street was also a pizza party just yesterday? If you’re going to say ‘so long’ to bread (or at least, ‘I’ll give you a call when I’m really in need’), you may as well have one more fling with the one you know you can’t resist. Say it: P-I-Z-Z-A. 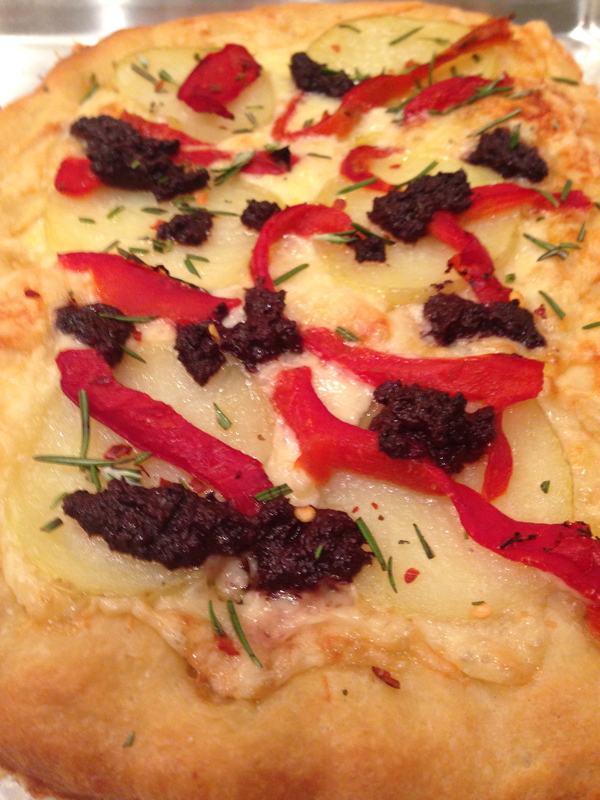 With my dough in hand, I was reminded of an amazing recipe in the March 2009 issue of Bon Appetit that my family adores: Pizza with Fontina, Potatoes, and Tapenade. I rolled out my dough. Oh goodness, I love the smell of yeasty dough. 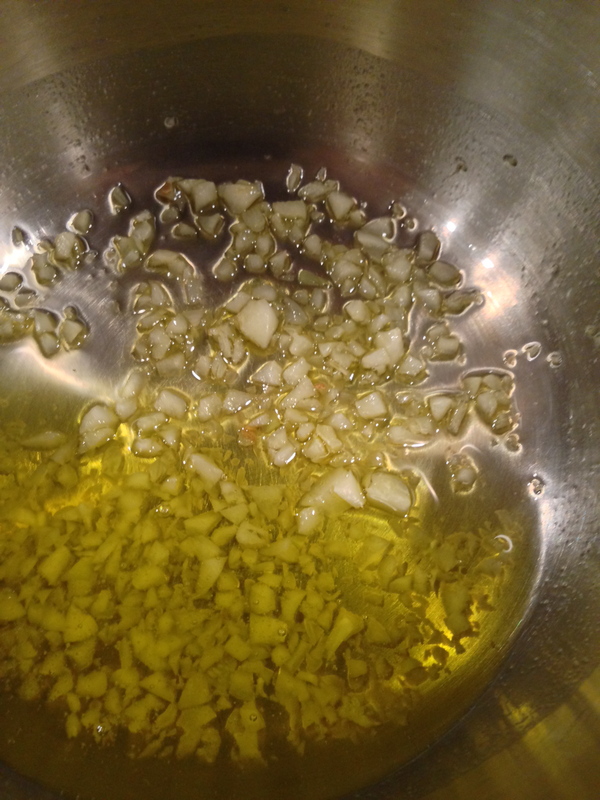 Flash-simmer chopped garlic in a bath of olive oil. Put it aside to let the garlic infuse the oil. Par-boil baby Yukons for just 12 minutes, then set aside to cool. The Parmigiano and Fontina go down first, making a bug-snug bed for what’s to come: Roasted red peppers, the potatoes, and black olive tapenade. You’re imagining it, aren’t you? I know you’re hungry. Brush those potatoes and the border of the pie with the infused oil. BAM. Bake it for 15-20 minutes. Pull it out of the oven and immediately shower with salt, red pepper flakes, and fresh rosemary. I felt compelled to serve this decadent pizza with something equally as healthy. You know, just to balance out all that bad. Was this salad healthy? It’s got kale in it, so it must be. Man, is it good. 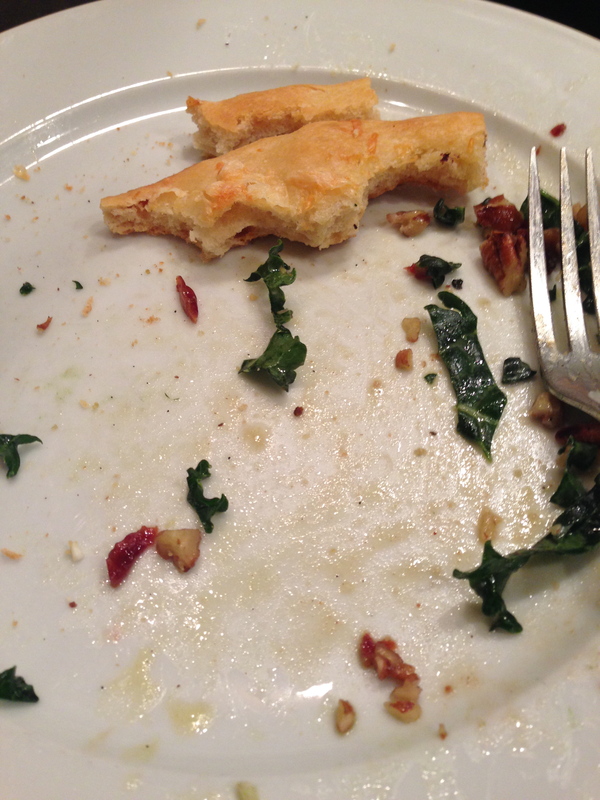 Kale fans and kale non-believers will go back for seconds, even thirds (which is what my family did). This salad is to die for. I cannot tell a lie. 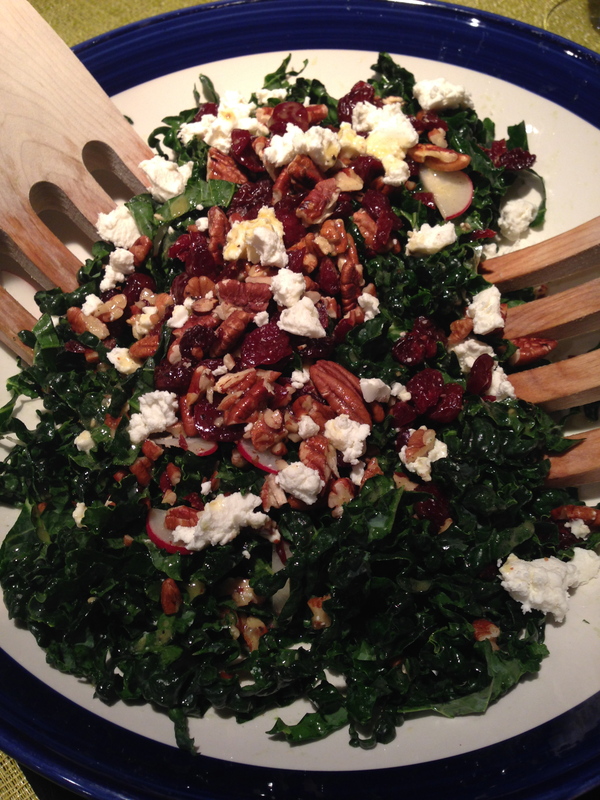 Finely ribboned kale, dried cherries, toasted pecans, paper-thin radishes, and goat cheese. Whaaaaaatt?? A simple but perfect dressing of honey, olive oil, Dijon mustard, and white wine vinegar. Just stop reading and go get the ingredients. Make this the good to your bad, the saint to your (pizza) sinner, the healthy choice I promise you won’t mind is truly healthy. Tip: Toast the pecans and chop them with the cherries. Worth the detail. What’s life without a little naughty? Not much, if you ask me. But then look right there, you’ve got kale to confess all your dough sins to. It’s all good. Stir warm water and yeast in small bowl. Let stand 5 minutes to dissolve. Stir in 2 tablespoons oil. Mix flour and 1 teaspoon salt in processor. With machine running, add yeast mixture, then 1/2 cup cold water; process until dough forms ball on top of blade. Process 45 seconds longer. Transfer dough to lightly floured surface. Knead until smooth, 1 to 2 minutes. Pour 1 tablespoon oil into medium bowl. Add dough to bowl; turn to coat. Cover with plastic wrap and let rise in warm draft-free area until doubled in volume, about 1 hour 15 minutes. Heat remaining 3 tablespoons oil and garlic in small saucepan over low heat until mixture begins to bubble, 1 to 2 minutes. Set garlic oil aside. Place potatoes in medium saucepan. Add enough cold water to cover. Sprinkle with salt. Cover and bring to boil over high heat. Reduce heat to medium and boil with lid slightly ajar until almost tender, about 12 minutes. Drain; let stand until cool. Place pizza stone or baking sheet (if using rimmed sheet, turn upside down) in oven. Preheat oven to 450°F. Transfer dough to work surface. Roll, pat, and stretch dough to 12- to 14-inch round (or two smaller rounds, if desired). Sprinkle pizza peel or another baking sheet (if using rimmed sheet, turn upside down) with cornmeal. Transfer dough round to prepared peel. Using thin knife, cut potatoes into 1/8-inch-thick slices. 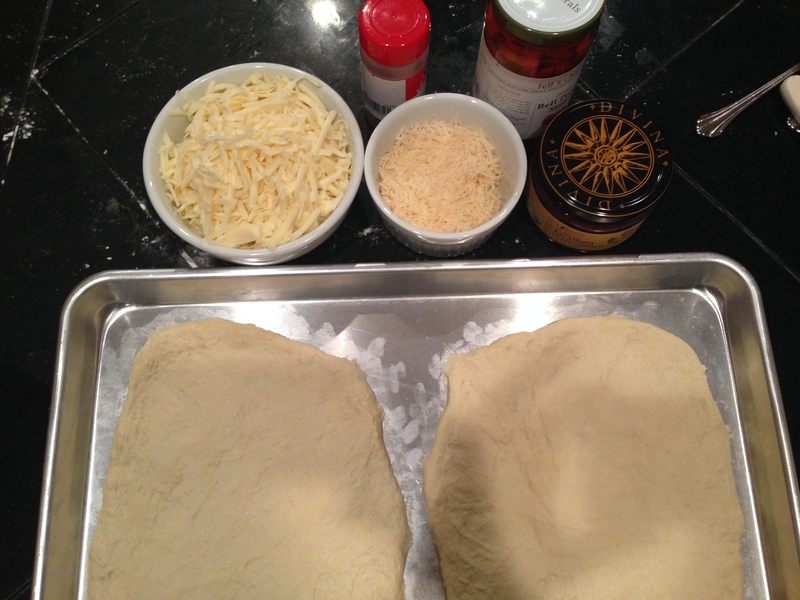 Sprinkle dough with Parmigiano-Reggiano and Fontina, leaving 1-inch plain border around edge. Arrange potato slices over cheese, then brush potatoes with garlic oil. Sprinkle roasted red peppers over pizza. Spoon heaping 1/4-teaspoon dollops tapenade over. Brush dough border with garlic oil. 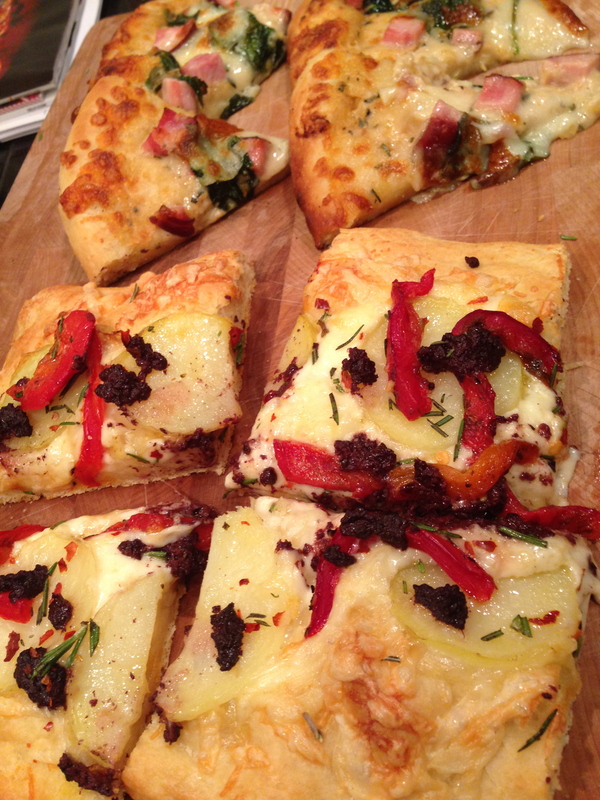 Slide pizza from peel to pizza stone or baking sheet in oven. Bake until bottom of crust is golden brown and cheese is melted, 15 to 20 minutes. Using peel, transfer pizza to cutting board. 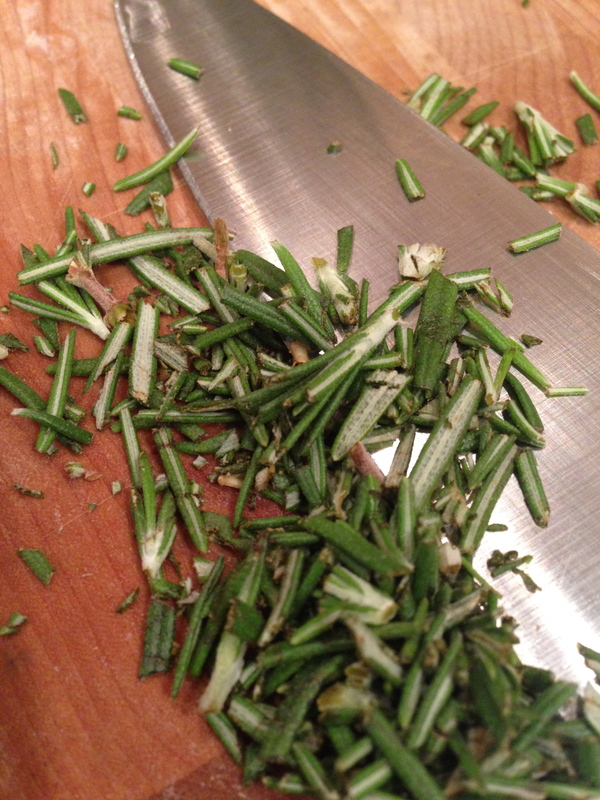 Sprinkle with chopped rosemary, crushed red pepper, and salt. Cut into wedges and serve. Wash and dry kale. Remove rib from each stalk then slice kale very thinly into ribbons. Throw kale in a bowl and top with sliced radishes. Pour 3/4 of dressing on kale and radishes and toss. Chop pecans and cherries together on a board and sprinkle on salad. Crumble goat cheese over the top and pour the remaining dressing over the top and toss. This entry was posted in Main Dishes, Salads, Vegetarian and tagged Fontina cheese, kale. Bookmark the permalink.